Before Comrade Keith Percy came to Boulder he was living on “a literal dead-end street” in northwest Michigan. It was symbolic as the council candidate says he was out of educational options, was a liberal in a conservative environment and didn’t feel safe to be queer. Percy, who is 30 years old, recently celebrated his eighth anniversary in Boulder. He came to the city to attend Naropa University. Percy graduated from Naropa in the winter of 2009, with a bachelor’s degree in writing and literature and a minor in peace studies. He had difficulty, though, moving about the campus in a wheelchair as the campus is older and not up-to-date on accessibility codes. Percy, who has published two books of poetry, has experience working in the Allen Ginsberg Library and for the Centers for People with Disabilities. “I think what makes me different from other candidates is I’m a poor, disabled, queer activist,” Percy says. 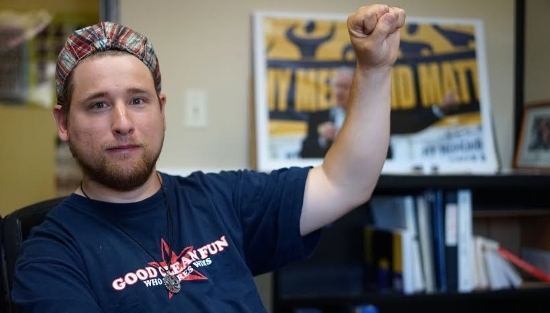 He has been active in numerous social-justice movements, including those aimed at ending racism and the Black Lives Matter protests that gained momentum after the shooting of Michael Brown. Ilan Sherman, who met Percy through Black Lives Matter protests, is serving as Percy’s campaign manager. Sherman, a teacher at New Vista High School, has invited Percy to be a guest speaker, talking to the students about his work as a disability rights activist and social change. Sherman says he’s seen Percy be a consistent voice for those who are under-represented in Boulder, including the black community, transgendered citizens and those with disabilities. Percy is a regular at community meetings, rallies, vigils and discussions that center around social justice issues and he’s never afraid to speak his mind, Sherman says. “That’s the kind of person we need on City Council,” Sherman says. Percy says he’s concerned that Boulder isn’t as open and accepting as it bills itself to be. He says he’s watched his fellow comrades get pushed out of Boulder because they’re priced out or they don’t feel welcome. “Diversity knocks and it gets shot out,” he says. Percy says he knows the struggles of affordable housing shortages in Boulder as he’s living on housing vouchers and disability checks. He sees potential in cooperative housing and in tiny homes. He also suggests that Boulder, rather than targeting the homeless with camping bans, open up the city for a camping season—with, say, a season of April to October. A small $10 to $14 donation-base maintenance fee could keep the site orderly and clean. If elected, he wants to better the treatment of Boulder’s homeless population. He also wants to address police brutality, confront racism and build queer culture. Percy has a few favorite spots in Boulder. He enjoys the midwestern atmosphere at Mustard’s Last Stand on Broadway, and North Boulder Park is his go-to meditation spot. “I meditate as much as I can,” Percy says. He also enjoys making computer art, reading and writing.